Sri Lanka. Sri Lankan food deliciousness again (Sri Lankan Carrot Salad, Malu Kirata & Kiri Hodi). That's right ladies and gentlemen. Me, quite a Lankan home chef. What's store in for us today? Miris Malu. Miris Malu? Sri Lankan Fish Curry and my version from my Malaysian kitchen. Malaysian kitchen (Mathi Achar, Meen Puttu, Indian Spiced Salmon & Bengali Yogurt Fish Curry)? Indeed. Me giving a twist to the originality of Miris Malu for my version. In other words, Nava-K's version. But, lemme me assure you that nothing is compromised. Not spiciness, and definitely not sourness, but? Natural sourness from mango (Malabar Fish Curry) instead of Lankan tamarind (Meen Muringakka Kulambu & Assam Curry Fish). Should be fine right? Why not? Because, like I have already told you, without compromising on the quintessential fish curry proudness and profoundness on how a typical and authentic Lankan fish curry must be. Furthermore, when cooked in claypot like in Sri Lanka? Pour Oil and heat up. Sauté shallots, ginger paste, garlic paste and curry leaves. Stir and fry without burning till aromatic and oil floats. Add fish, tamarind and salt, Gently stir. Simmer and cook till fish is 3/4 cooked. Add mango and cook to soften both the fish and mango. Pour in coconut milk and gently stir without breaking the fish. Heat, just a little while and remove from heat. I love fried bawal hitam dip in kicap but yet to try curry style. Thanks for sharing your recipe. That looks so flavorful and yum! And I'm sure the clay pot adds to the taste! 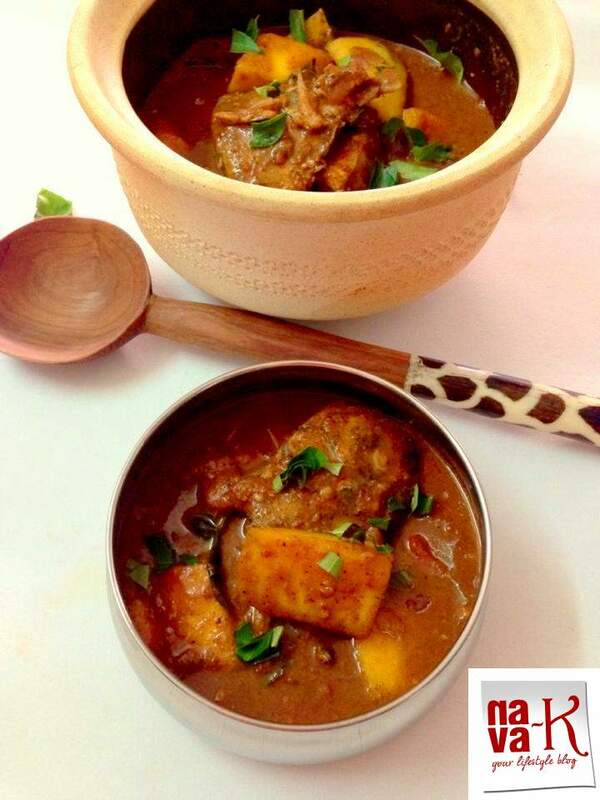 My mom use to make fish curry in clay pot. Lovely color. Looks so tangy and yummy! Very delicious! I really love a good curry gravy. The curry looks fabulous! I love your pot and ladle too. I do watch the famous Sri Lankan/Aussie chef, Peter Kuruvita, and your dish is like the one shown on his show. Drooling here. Wow i'm not in a position to comment... just drooling! Fish, curry, mango oh my yes I will take a big bowl now.